Info "Get rid of all the wrinkles in your shirt. You look like a slob! Oh wait, that's me." Hard-Pressed is one of Mona's microgames in WarioWare: Twisted! 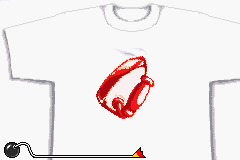 The purpose of the game is to change the iron's direction in order to iron out the wrinkle spots on the T-Shirt. 1st level difficulty: There is one wrinkle to be ironed. 2nd level difficulty: There are two wrinkles to be ironed. 3rd level difficulty: There are three wrinkles to be ironed. This page was last edited on September 19, 2018, at 20:49.